God I do... and that's scary in and of itself. Guess what, they are still a round. PS - the last thing I was expecting on a "culinary history" thread was junk food, regardless of how "classic" the junk food might be. Did anyone else have home delivery of Charles Chips? We had very little junk food in our house growing up. No Oreos, TV dinners, etc as Mom made everything from scratch. Getting popcorn and a glass of orange Faygo on Saturday night while we watched Sea Hunt and Gunsmoke was a big deal. 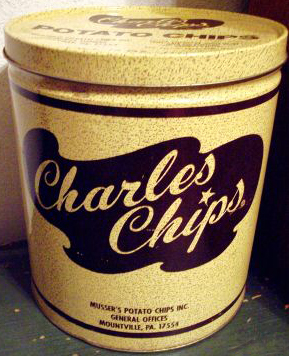 My father had a particular weakness for Charles Chips though, one which we kids exploited every chance we could, so when the Charles Chips man would drive up in his 'milk delivery' truck we would cajole and plead with Mom that she should get them for Daddy! Of course, I remember them... the chips tasted like can.